The American Woodcock is so well camouflaged that it is extremely difficult to spot as it probes the forest floor for earthworms. This "shorebird" is most active at dawn and dusk and lives in moist low woodlands year round across Tennessee. It is most easily detected when the male performs his aerial courtship flights on warm nights especially in February. At dusk a male will move to an open field where it gives several harsh, nasal peents before flying 50 to 100 yards into the air. While ascending his wings make a twittering sound and he gives melodious chirps before rapidly returning to the ground to start the display again. The American Woodcock is found primarily in the eastern half of North America, retreating to the southern portion of the range in winter. Description: This medium-sized stocky sandpiper has large black eyes, a long bill, and appears to have no neck. It is pale orange-buff below and mottled brown, black and gray above. Males, females, and juveniles look similar, and there is no seasonal variation in plumage. Voice: Silent except for the male courtship display including harsh, nasal peents given from the ground and liquid chirps during the aerial portion of the display. The twittering sound during the aerial display is made when air rushes through the outer wing feathers. Wilson's Snipe similar in shape, but with tan stripes on the head and back, barring on the sides, and a white belly. Ruffed Grouse also well camouflaged, but has a short bill and longish tail. Habitat: Moist low woodlands with openings and shrubby areas, especially young forest and abandoned farmland mixed with forest. Nesting and reproduction: The male begins courtship displays on warm evenings intermittently from mid-October through December, regularly from January into March, and then intermittently again through May. The male will mate with several females but has not further role in nesting. Clutch Size: Usually 4 eggs. Peak nesting in Tennessee is in the first half of March. Incubation: The female alone incubates the eggs from 20 to 22 days. Fledging: The young leave the nest within hours of hatching, are able to fly in about 2 weeks, and independent in about 5 weeks. Nest: The nest is a slight depression on the forest floor and the eggs are laid on dead leaves. Status in Tennessee: The American Woodcock is an uncommon statewide permanent resident. It is most common during spring and fall migration, rare in winter, and as a breeding bird it more common in the eastern two-thirds of the state. The woodcock is a game species in Tennessee, requiring a TN Migratory Bird Permit. The hunting season is usually in November and early December. 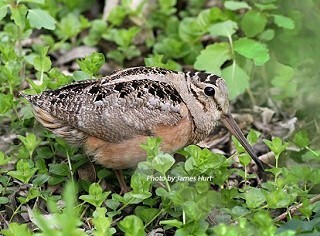 The tip of the woodcock's bill is flexible and has sensory pits near the tip making it easier to catch earthworms. A female may visit four or more male singing-grounds before choosing the male she will mate with. She may continue to visit singing-grounds even when she is caring for her young. Woodcock migrate at night. They fly at low altitudes, individually or in small, loose flocks. Flight speeds of migrating birds have been clocked at 16 to 28 miles per hour, and it is believed that they orient visually using major land features such as coastlines and broad river valleys.